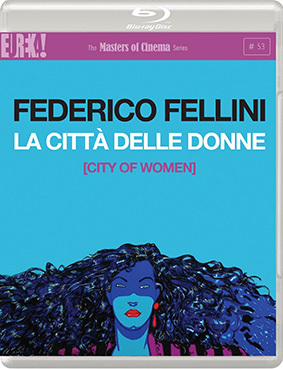 Federico Fellini's epic 1980 fantasia La città delle donne (City of Women) introduced the start of the Maestro's delirious late period. A surrealist tour-de-force filmed on soundstages and locations alike, and overflowing with the same sensory (and sensual) invention heretofore found only in the classic movie-musicals (and Fellini's own oeuvre), La città delle donne taps into the era's restless youth-culture, coalescing into nothing less than Fellini's post-punk opus. Marcello Mastroianni appears as Fellini's alter ego in a semi-reprise of his character from 8-1/2, Snàporaz. As though passing into a dream, the charismatic avatar finds himself initiated into a phantasmagoric world where women – or an idea of women – have taken power, and which is structured like an array of psychosexual set-pieces, culminating in a bravura hot-air balloon that decisively sticks the "anti" up into "climax". A great adventure "through the looking-glass," as it were, of Fellini's own phallic lens and life-long libidinal ruminations, La città delle donne sharply divided critics at the 1980 Festival de Cannes, some of whom had merely anticipated a nostalgic retread of the earlier Mastroianni works. What they were greeted with, and what remains today, is, in the words of Serge Daney, "a victory of cinema". La città delle donne will be released on UK Blu-ray and DVD on 25th February 2013 from Eureka as part of the Masters of Cinema Series in Gaumont's glorious new HD restoration, in 1080p on the Blu-ray and with newly translated optional English subtitles.